It feels like it’s been awhile since a new Moto smartphone was on T-Mobile’s shelves, but that might change soon. The Moto Z2 Force is rumored to be coming to T-Mobile, and today a report claims to have spilled many of the device’s specs. Moto has equipped the Z2 Force with a 5.5-inch 2560×1440 Super AMOLED display, says VentureBeat, and the screen includes ShatterShield technology to help protect it against drops. Above that display is rumored to be a 5-megapixel camera, and around back is a pair of 12-megapixel cameras. Typically when a phone has dual rear cameras, its secondary camera is used for something special like an optical zoom or a black and white lens, but it’s unclear what special features the Moto Z2 Force’s dual rear camera setup may offer. Rounding out the Moto Z2 Force’s rumored feature set is a Snapdragon 835 processor, 4GB of RAM, 64GB of built-in storage, and a microSD slot for adding more storage. The whole package is said to be powered by a 2730mAh battery. The leaked image also shows several connector pins at the bottom of the Moto Z2 Force’s backside that are used for attaching Moto Mods. Motorola is holding an event on July 25th, and it’s expected that the Moto Z2 Force will make its official debut there. 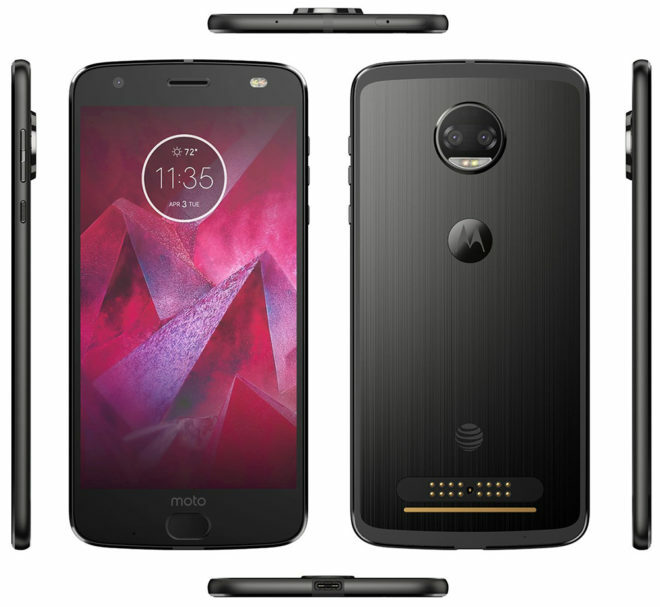 It’s said that T-Mobile will be getting an exclusive Lunar Grey color option for the Moto Z2 Force. Considering that T-Mo missed out on the original Moto Z Force, as well as the other Moto Z phones, it’s nice to see that the Moto Z2 Force will be coming to U.S. carriers not named Verizon. It’s kind of disappointing that the Moto Z2 Force will reportedly have a smaller battery than the Z Force (2730mAh vs 3500mAh), and the apparent lack of a 3.5mm headphone jack may turn some people off, but it will be nice to have the option of the Moto Z2 Force on T-Mobile for folks that find Motorola’s Moto Mod accessories appealing. Just wait on Swappa, if you cannot afford a nice flagship device. Trust me all high end smartphones loose about $100 easily in less than one month. I know that, because I’ve done countless research. I wonder if they made it 600mhz compatible?? What about waterproofing? It’s a feature becoming more common with flagships, and it just makes sense to tout this as a phone that can withstand drops and splashes. You mean water resistant? Yeah, smartphones can no longer claim waterproof, example Samsung Galaxy S6 series, also Sony had to remove that in future add once one of there flagship devices didn’t quite meet the expectation. Drop test??? Don’t be silly, people are so reckless with smartphones, they will just ugly up the device with a cough cough otter…, and screen protector. Actually yes Samsung had a so called waterproof phone (loose term) s6 active. It was quickly changed to water resistance. Also, first batch of the S7 active suffered water damage related issues, again from then on Samsung only could claim water resistant, not waterproof. I’m talking about the general population, not those who are mindful. Looks like a replacement for the Charging-Blocked:Moisture Detected LG G6. Yeppp! You taking it in salt water? I would consider this is they released the keyboard moto mod. With that, I could it making a huge gain on other phone. Physical keyboards are useful for folks who don’t have tiny hands. Unless it has band 71 it would be foolish to sink serious money into this phone…only one month before the start of 600mhz rollout….save your cash for a phone that has all of T-Mobile bands. Very few people will be covered by the initial rollouts. It’ll be a few years for most to see anything in their area. Also most new phones won’t have band 71 support until next year. Don’t even worry about band 71 for the next couple of years UNLESS you’re in one of the areas with an early rollout. I remember that same line with band 12; it will be years. So I bought a LG G3…then band 12 was starting to get turned on. Six months later as I watched band 12 getting fired up everywhere and my sons lowly LG Leon getting better reception than my flagship I ended up getting a LG Stylo and threw the G3 in a drawer. It made that much of a coverage difference. Not this time. I travel so I will get the benefit even if it takes a year to get to my area. Exactly! And the new flagships like the Note and V30 will still support the other bands as well so why not? Anyone considering a flagship priced device should demand band 71. If you’re only dropping $200 or so I don’t see any reason to wait. That’s just me. Of course…Qualcomm released a statement saying all new SD 835 with X16 LTE modems will support Band 71…just curious if this will be one of the first. Don’t forget the band aggregation part either. The battery may sound small but the 835 is ridiculously efficient. My U11 has a 3000mAh battery and I get 6-7 hours of screen on time plus 20 hours of standby and I play a ton of games, it’s a stock ROM so it has the battery draining trash that is News Republic, I have sync and notifications for Facebook, Twitter, and Gmail, and I have turned off power saver features other than letting Boost+ optimize some of my games. Compare that with my HTC 10 with the SD 820 and same size battery – 4 to 5 hours screen on time plus around 12 hours of standby time, sync and notifications off for Facebook and Twitter, custom ROM and custom kernel, underclocked CPU and GPU, less games (all optimized with Boost+), brightness extremely low. The 835 is just a beastly and efficient chip. I’m beyond happy with my U11 (I’d actually say it’s the best device I’ve ever owned) but it’s good to see that T-Mobile might finally get a Motorola flagship. Hopefully they don’t price it like Verizon did with the original. I’m only frustrated because I’m waiting on this phone, like forever, but I also thought it was going to see the return of the headphone jack, (unlike the previous Z-Force). If the new one still doesn’t have the headphone jack, either I’m going to need to find a mod case that does, or it might be a dealbreaker for me. If you want a good phone and don’t like getting security or Android updates, buy a Motorola phone. Lenovo has ruined Motorola. I will never give this POS company one dime. I’m using a Verizon Moto Z Droid Play on T-Mobile for only a few months and it’s seen updates at least twice. No headphone jack is a deal breaker for me! Other companies need to stop copying apple, so tired of it!